While doodling away with another Golem which just happened to be a rather heart-shaped fellow, I was thinking about games and conflict and caring. Anyone who has played board games will know that they are largely about conflict with a strong leaning towards winning where that means the defeat of other players or entities of some sort. Co-op games may change things up by having non adversarial players, but the activities the players undertake are generally targeted at defeating something. Why am I rabbiting on about this, well if I look at some types of ‘play’ – particularly for girls there are more subtle things going on than the hero going toe-to-toe with an even bigger bad guy. There is care, nurturing, social interaction and drama of various sorts. 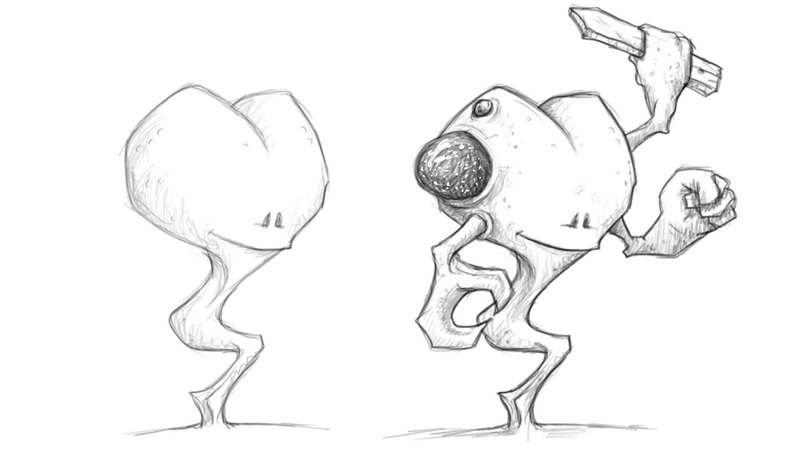 My premise for the Golem game was conflict-centric, the players are fighting the enemy with their golems. This isnt a very nurturing state of play, even if it is phrased as ‘defending’. Maybe the player will ‘care’ for the golem they create in some manner, or at least have the mental and mechanical means to do so. Then I was thinking about layers and priorities. Having the avatars in the game trying to achieve multiple things at once is good. At the same time they are trying to assemble a halfway useful golem to defend the place with – they are also having to make choices on other fronts as well. Spending resources on a tech-tree, finding true love, cooking a decent meal, competing in an eisteddfod, learning to play the tuba, watering the garden, learning complex chemistry or keeping up with their social media commitments are all good counters to the main ‘plot’ which flesh out the world and probably make for a more fun game. Clearly having all these things is too much, but choosing ideas like this that bring concepts like nurturing or compassion or healing or friendship etc into a conflict-based game seems a nice way to go about crafting the next layer of the game. If I return to the ‘dance school’ version of the theme then that flavours these layers but the same could work just as well for a Cooking School or a Chess Club or even the Community Garden. I like the idea of maybe having a shared ‘social’ track which powers cards like ‘Tantrum – lose 2 social points to storm off on your own and draw 2 more cards into your hand and then discard 2 of your choice’. Plus having the ‘dress-up’ part of the game where players can rig their Golems with fun bits is just entertaining and nothing to do with conflict or winning.